“When I was younger,” Sherrie Maricle says, “it was almost a mission to blend in with all the men I was playing with. Not to be viewed as female in any way.” But Maricle, a drummer inspired by the precision and power of Buddy Rich, found her calling as a leader of women — specifically, as leader of The DIVA Jazz Orchestra, which recently marked 25 years as a proving ground, a pipeline and a rejoinder to any lingering bias that this music is a masculine domain. Jazz Night in America recently caught up with Maricle and the band at Dizzy’s Club in New York during an album celebration for The DIVA Jazz Orchestra 25th Anniversary Project. In this radio episode, we’ll hear some of that new original music. And we’ll hear from a few DIVA musicians, including Alexa Tarantino, an excellent saxophonist who was born in the same year as the band. 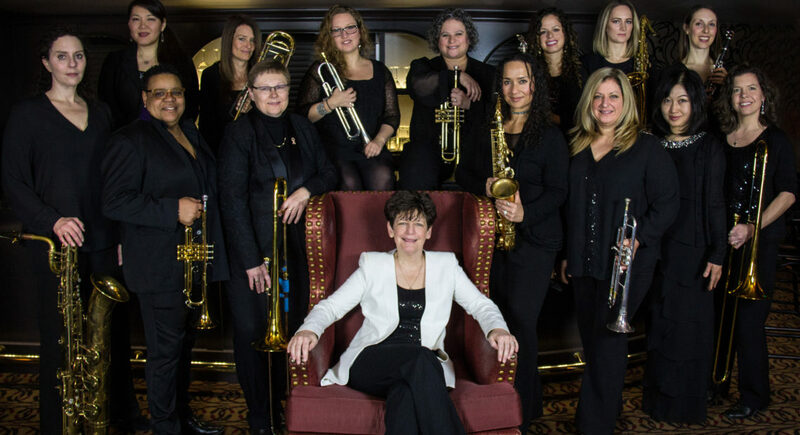 Core band with leader/drummer Sherrie Maricle; pianist Tomoko Ohno; bassist Noriko Ueda; alto saxophonists Alexa Tarantino and Mercedes Beckman; tenor saxophonist/clarinetist Janelle Reichman; tenor saxophonist Cynthia Mullis; baritone saxophonist Leigh Pilzer; trumpeters Liesl Whitaker, Jami Dauber, Rachel Therrien, and Barbara Laronga; trombonists Jennifer Krupa, Hailey Brinnel, and Leslie Havens. Special featured guest trumpeter Ingrid Jensen.